Most of us are aware that diamonds are expensive, look for reasons and you will end up with some very obvious answers. Diamonds are rare there is no doubt about that, higher quality and bigger sizes always carry a premium. This glittering beauty has always been a symbol of status and the high point of style. Given the popularity of diamonds in matrimonial jewelry, high prices are often not a deterrent to buying. One truth that you will not hear of relates to the inefficiencies in the diamond supply chain. Lengthy paper work and expensive staff deployment are absolutely necessary, from the time that a piece of rough diamond is mined from the earth right up to the moment when, it is ready to be set in a jewel. The journey made by a diamond is almost always, dotted with middlemen and brokers. The paperwork and other labor intensive routines are repeated at each point. Combine these expenses with added charges like commissions and brokerage fees, you will end up with a hefty addition to the price tag. The truth is that the final consumer has no clue as to the selling price fixed by the actual (first) seller. The buyer has to evaluate the stone and consider the price being requested. In real life, the final price demanded from the consumer could be 30 to even 50% more than, the price fixed by the original seller. Putting this in another way, the consumer gets just 50% to 70% diamond value for the price paid. If you place the original seller on one side and the final consumer on the other, it is apparent that the present inefficient system benefits neither. A high price and low diamond value, can only disappoint buyers. This can often result in a lost sale, something that is bad for the seller. There was a time when the demand for diamonds was so strong, that high price points never really dampened market sentiment. Things are different today, young couples ready to tie the knot are drawn towards other natural gemstones. Diamonds are not totally out but they are surely becoming lesser important. Fear of receiving fake diamonds or stones treated to enhance their beauty, results in many lost sales. 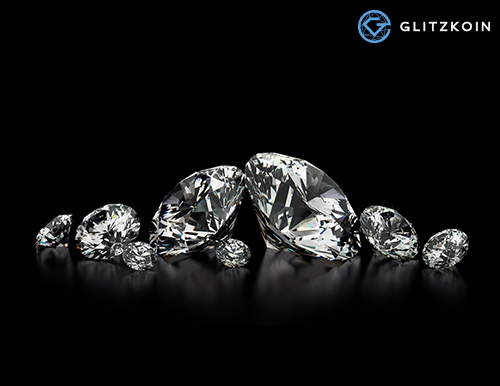 The diamond experts in the GLITZKOIN team are fully aware of the deficiencies in diamond trading operations. This is what prompted them to bring aboard the finest talents in blockchain technology, the project is focused on building a diamond blockchain that functions as a trading platform. Also included in the project plan is the implementation of a crypto currency that, would be used to settle diamond transactions.